Battle of the Midsize Trucks Heats Up; Winner Up for Grabs - Cox Automotive Inc.
Last year marked the start of Truck Wars with the launch of new full-size pickup trucks from Ram and General Motors taking on the king-of-the-hill Ford F-150. This year, Truck Wars 2 shifts focus to smaller trucks. The 2019 Ford Ranger, a nameplate brought back after a long hiatus, is now on sale and selling like gangbusters to the point that Ford is adding production and booking massive overtime for assembly workers. Fiat Chrysler launches the intriguing 2020 Jeep Gladiator later this year. At the recent Chicago Auto Show, Toyota unveiled a freshened version of the Tacoma, the dominate player in the segment. In fact, the Tacoma stuck around when almost every other vehicle maker abandoned the segment. Nissan also hung in there with its aged Frontier, due for a makeover early next decade. GM returned to the segment with the Chevrolet Colorado and GMC Canyon, which sold so well it spurred Ford to get back in the game. Honda also re-entered the fray with a reinvented Ridgeline. The winner of Truck Wars 2 is up for grabs, based on an analysis conducted by Cox Automotive that shows how buyers of midsize trucks are different from buyers of full-size pickup trucks. 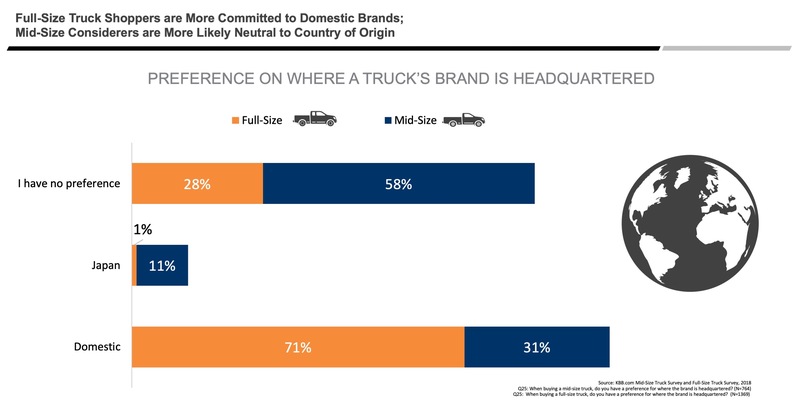 Full-size truck owners are extremely loyal to the segment and the brand. They are the most loyal in the industry. Midsize truck buyers are the complete opposite. They are the last in brand loyal, suggesting newcomers have an opportunity to conquest competitors. Indeed, the Chevrolet Colorado and GMC Canyon grabbed sales from Toyota Tacoma when they came to market. Toyota will do what it can to retain current leadership, but Ford Ranger and Jeep Gladiator undoubtedly will grab some share. It’s also likely the entire segment will expand as often is the case when new entries come into a segment. 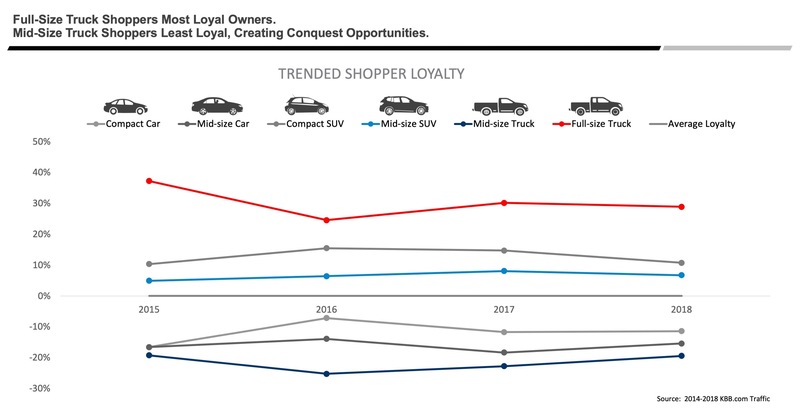 Full-size truck owners are also loyal to American brands. Midsize truck shoppers care little about country of origin. Full-size truck owners are more apt to reside in the Heartland. 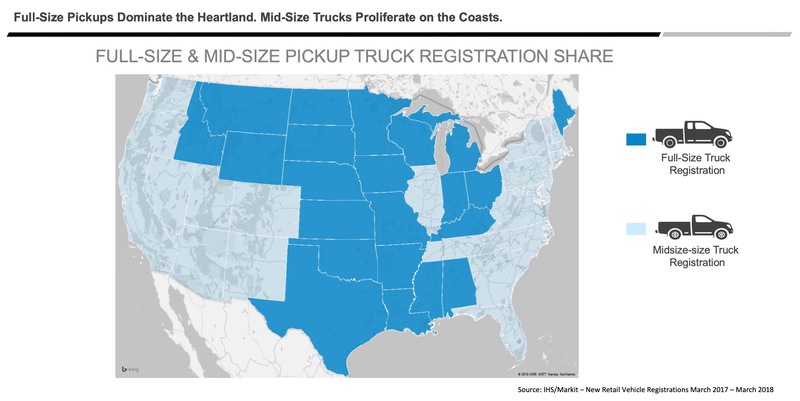 Midsize trucks are more popular on the coasts. Full-size truck owners generally use their vehicles for work. 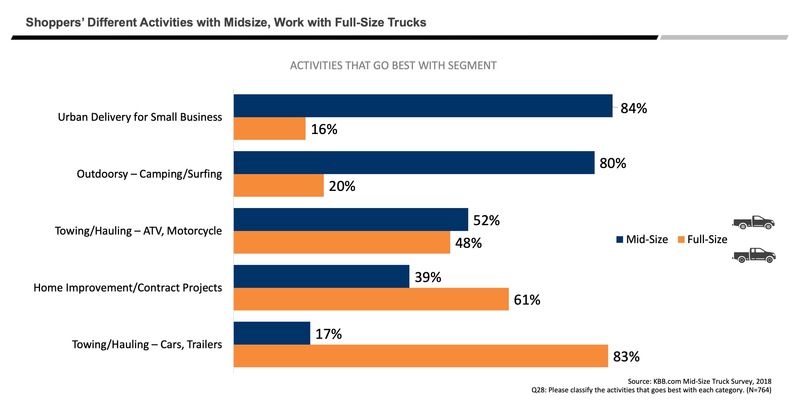 Midsize truck shoppers intend to use them more for play than work, though they are used for some light-duty jobs. The fact that they are used for leisure activities suggests they are more discretionary purchases. That causes us to consider that when an economic downturn comes, as it surely will and could come possibly as early as next year, midsize truck purchases could be put on hold. Alternatively, midsize trucks in a softer economy could substitute as a more affordable alternative to larger trucks. Truck sales, market share and prices keep climbing. One would think at some point they would hit a ceiling. Question is when, who wins and who loses.